Recurrent deletions of the CDKN2A/ARF/CDKN2B genes encoded at chromosome 9p21 have been described in both pediatric and adult acute lymphoblastic leukemia (ALL), but their prognostic value remains controversial, with limited data on adult T-ALL. Here, we investigated the presence of homozygous and heterozygous deletions of the CDKN2A/ARF and CDKN2B genes in 64 adult T-ALL patients enrolled in two consecutive trials from the Spanish PETHEMA group. Alterations in CDKN2A/ARF/CDKN2B were detected in 35/64 patients (55%). Most of them consisted of 9p21 losses involving homozygous deletions of the CDKNA/ARF gene (26/64), as confirmed by single nucleotide polymorphism (SNP) arrays and interphase fluorescence in situ hybridization (iFISH). Deletions involving the CDKN2A/ARF/CDKN2B locus correlated with a higher frequency of cortical T cell phenotype and a better clearance of minimal residual disease (MRD) after induction therapy. Moreover, the combination of an altered copy-number-value (CNV) involving the CDKN2A/ARF/CDKN2B gene locus and undetectable MRD (≤ 0.01%) values allowed the identification of a subset of T-ALL with better overall survival in the absence of hematopoietic stem cell transplantation. The online version of this article ( https://doi.org/10.1186/s13045-018-0639-8) contains supplementary material, which is available to authorized users. 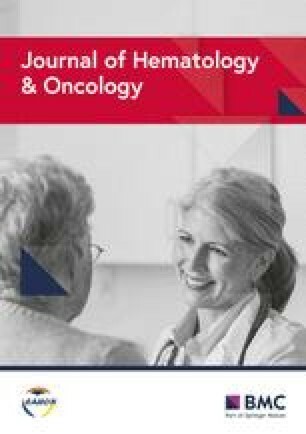 At present, treatment response based on minimal residual disease (MRD), monitoring for early and accurate identification of high-risk patients in whom treatment might be intensified, represents a milestone in virtually all childhood and adult acute lymphoblastic leukemia (ALL) trials [1, 2]. Despite this, more extended molecular analyses performed at diagnosis in ALL have also proven to contribute to the identification of ALL subtypes that respond better to specific targeted therapies and to refine the classical risk-stratification schemes used at baseline . However, from all genomic markers identified so far , only a few are routinely used for the clinical management of ALL, particularly in T cell ALL (T-ALL). This is due to the still limited data available about their frequency and independent prognostic impact, in large cohorts of T-ALL patients homogeneously treated in the MRD era. Here, we investigated the presence and frequency of copy-number-value alterations (CNA) at chromosome 9p21 which involved the CDKN2A/ARF and CDKN2B genes in a cohort of 64 adult T-ALL patients enrolled in two consecutive Spanish PETHEMA (Programa Español para el Tratamiento de Hemopatías Malignas) trials (details about the patient cohort are available in Additional file 1: Figure S2 and Table S4), using a genomic quantitative polymerase chain reaction (qPCR) technique [5, 6] (Additional file 1: Table S1). An overall frequency of CNA at chromosome 9p21 of 55% (35/64 cases) was observed, 20% of the cases (13/64) showing a discrepant CNA profile for the CDKN2A/ARF and CDKN2B genes. Of note, the CNA values identified by qPCR were fully concordant with those obtained by SNP-arrays and iFISH analyses, once qPCR CNA values had been corrected for the contamination by normal DNA-diploid cells in the sample (Additional file 1: Table S2). A significant association was observed between the presence of (bi- or mono-allelic) deletion of the CDKN2A/ARF/CDKN2B genes and cortical T-ALL (T-III, according to the EGIL criteria)  (47%), while this molecular alteration was found at very low frequency in the early T cell precursor ALL group  (ETP-ALL, T-I or Pro-T according to the EGIL criteria) (3%; p = 0.002). Adult T-ALL patients showing (bi- or mono-allelic) deletions of CDKN2A/ARF had deeper MRD responses (MRD levels ≤ 0.1%) than those who had normal copy-number-values (CNV) (90 vs. 68% of cases, p = 0.04) (Table 1), while there was a trend for CDKN2B gene deletions (89 vs 71%; p = 0.11). When deletion of the CDKN2A/ARF and/or CDKN2B genes were considered together, differences were statistically significant (91% vs 65%, p = 0.02). This is due to the fact that among the CDKN2B non-deleted cases, some patients with deletions of the CDKN2A gene were included. Therefore, the identification of a pure CDKN2A/ARF and CDKN2B non-deleted group of patients allowed for a better discrimination between good and poor responders. This association was even more clear when we considered an MRD threshold of ≤ 0.01% (Table 1). In addition, no patient with (bi- or mono-allelic) CDKN2A/ARF/CDKN2B deletions required second induction therapy due to poor morphologic and/or MRD response, while 32% of patients harboring normal diploid CNV (two copies of the CDKN2A/ARF/CDKN2B genes) did (p = 0.001). Of note, most patients (6/8, 75%) who showed two copies of the CDKN2A/ARF/CDKN2B genes in their blast cells, and required intensification of induction therapy, had ETP-ALL (p < 0.001), such cases corresponding to 6/10(60%) ETP-ALL cases in the cohort. As a consequence of their better response to induction treatment, most patients with an altered CDKN2A/ARF/CDKN2B CNV (32/34, 94%) did not require an allogeneic-hematopoietic stem cell transplantation (allo-HSCT) according to the treatment protocol, in contrast to 11/28 patients (40%) with a normal diploid CDKN2A/ARF/CDKN2B genotype (p = 0.001). Overall survival (OS) analysis based on the CDKN2A/ARF/CDKN2B copy-number status, MRD data  and treatment with a transplant, as prognostic factors, allowed the identification of a subgroup of patients with a very good prognosis which showed mono or bi-allelic deletions of the CDKN2A/ARF/CDKN2B genes and MRD levels ≤ 0.01% (3y OS probability of 75% [56–94%]) vs. only 36% [8–64%]), for the remaining patients; (p = 0.05), when the OS was censored at transplantation (Fig. 1a); of note, the significance of the differences was lower (p = 0.1) when patients’ follow-up was not censored at transplantation (Fig. 1b). When we searched for independent prognosis factors for OS, we observed that despite deletions of the CDKN2B gene (particularly mono-allelic CDKN2B gene deletions), but not the CDKN2A/ARF gene deletions, conferred a better prognosis in terms of OS (3y OS probability of 63% [43–83%] vs.37% [18–55%], p = 0.045) (Additional file 1: Figure S1A-B) in the univariate analysis, MRD after induction therapy was the only variable with an independent predictive value for OS in the multivariate analysis (Additional file 1: Table S3). Our results are in line with the findings reported by Liu et al. , but need to be validated in a larger and independent cohort of adult T-ALL. Recently, it has been highlighted the importance of NOTCH I/FBXW7 and N/K RAS/ PTEN point mutations in the OS of adult T-ALL patients , therefore would be interesting to assess the impact of these point mutations in our cohort in combination, or not, with CDKN2B deletions. In summary, here, we confirm the high frequency of (mono and bi-allelic) deletions of the CDKN2A/ARF/CDKN2B genes also in adult T-ALL, and highlight the specific association between the loss of the CDKN2A/ARF and CDKN2B genes and a better response to therapy and prolonged OS, respectively. More importantly, identification of CNA in the CDKN2A/ARF/CDKN2B gene locus, together with the MRD levels at the end of induction, contributed to the identification of a subgroup of T-ALL patients in whom intensification of therapy with an allo-HSCT might not be of great clinical benefit. We would like to thank Ernest Terribes for his advice and help in qPCR design and analysis as well as Alba García and Jesús-María Hernández-Rivas for providing some DNA samples. We are grateful to Isabel Granada for her helpful advice regarding cytogenetic and FISH analyses. This project was supported by the Asociación Española Contra el Cáncer, AECC (project ref. : GC16173697BIGA), by CERCA Program/Generalitat de Catalunya, the Catalan Government: 2014-SGR225 (GRE), Obra Social “La Caixa” and by Celgene Spain. E. Genescà is the recipient of agrant from the Spanish Health Ministry (ISCIII, CA12/00468) and an unrestricted grant from Gilead.A. Gonzalez-Perez is supported by a Ramon y Cajal fellowship (RYC-2013-14554) of the Educational Ministry (Madrid, Spain). This work was also partially supported by FEDER funds from the ISCIII (PT13/0010/0026, CIBERONC (CB16/12/00284 and CB16/12/00400), Madrid, Spain). EG designed the study, analyzed the data, and wrote the manuscript. AL and GB performed the experiments and analyzed the data. MM performed statistical analyses. NR-X and PG-M performed FISH analyses. JR and JJ contributed to data analysis. AG-P helped to the SNP array analysis. SM, RG, MTA, MJM, JM-L, LZ, PB, CG, MT, AC, AN, JE, MP, JN, JG-C, MA, JC, PM, MB, and SV provided samples and clinical data. EF and FS provided economical support to the project though the IJC. AO provided samples, and together with JMR contributed to manuscript writing. All authors have read and approved the manuscript. Samples were obtained in accordance with the principles of the Declaration of Helsinki and the Spanish legislation for protection of personal data and research on human samples, after patients provided their written informed consent. The study was approved by the Institutional Review Board of the Hospital Germans Trias i Pujol (Badalona, Spain).